There are some that would say that social media is a fad or a waste of time. There are others that would say that you HAVE to be on social media if you want to be in business in the next 5 years. Regardless of if you agree with either of these ideas or fall somewhere in the middle, there is one immutable fact: social media is here and is popular. The most popular social network in the world is Facebook. At the time of this post, Facebook has over 500 million users. If you are reading this I am confident that you have a Facebook account or are likely to after you are done. I feel there is a ton of upside to using this medium, of which I won’t go into at length as that is not the purpose of this post. The biggest complaint I hear from people, real estate professionals being no exception, is information overload. Everyone wants to stay connected with the people in their lives whether that be friends, family, business contact, leads/prospects, or people/organizations for whom they have an affinity (being a fan). What happens is that, at some point, you wind up with many many connections. The average Facebook user has 130 friends alone and is a ‘fan’ of 80 pages/groups/events. That can easily lead to a very cluttered news feed, wall and inbox. Rather than become overwhelmed and frustrated, which sometimes leads to people giving up and deactivating their Facebook account. Segment the content of your news feed so that you can see things from only the people you want to. Sometimes you just want to check in on your family. Other times, you may wonder why your clients aren’t returning your calls. A status update stating that they are enjoying a frozen drink in Cabo may clear up that anxiety and keep you from making the mistake of leaving too many voicemails. This will help you see just those statuses and easily navigate them. Allow you to post content on your wall that will be targeted at specific people. My family doesn’t care that I am upset about the way Yahoo is handling Delicious but some of my fellow Lucky Strikers might. Accordingly, your family doesn’t care if you have gone paperless for the signing of buyer’s agency agreement. Another cool thing you can do is give some of your closest some whuffie like my buddy Mike Mueller did recently. This doesn’t help you get through the clutter but it’s a heck of a nice thing to do and will get you some notice. Everyone has a friend that has a business that they absolutely need you to like for them and you feel obligated to do so since you know them personally. There’s nothing wrong with that. However, this person could easily flood your news feed with the things that he or she wants their prospective clients to see. That’s not you. So hide them from your news feed. This way you can still do the nice thing by your friends without being overwhelmed by gratuitous status updates. 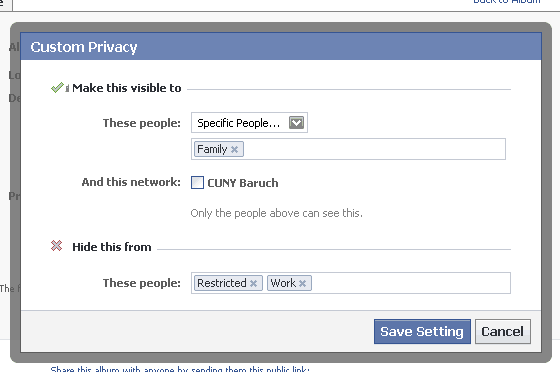 Hide anyone simply by clicking on the ‘X’ in the upper right hand side of any status update. Don’t worry, if you change your mind you can always undo this by going to the bottom of your news feed and clicking on the ‘edit options’ on the lower right hand side. I know that you are very proud of the pictures of you kid’s soccer games but I have something to tell you; most people don’t care. You are cluttering THEIR news feed with this stuff. Also, how well do you know some of these folks? I try to only friend people on Facebook that I have met in real life but I am not always 100% on that. At the end of the day, I don’t know if I want them looking at pictures of my 3 year old. It’s good to have things that are special only to you and those genuinely close to you. 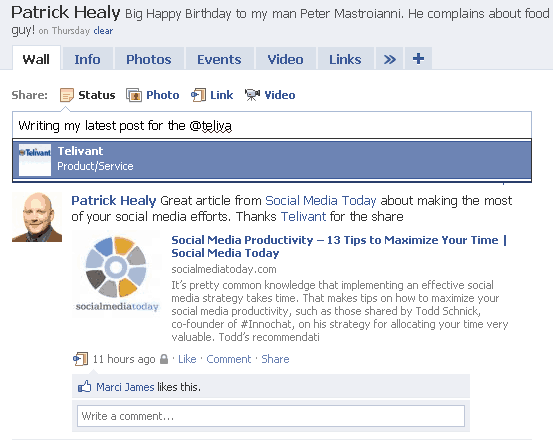 For that reason I am recommending that you make use of the great features up on Facebook. When you put a picture album up here, choose from the lists mentioned above of the people you do and do not want to see that content. You can do this for pictures and video in the ‘edit album info’ for individual photo albums and you can access your global privacy settings for video/photos/etc. under the account tab mentioned above. You can also do this for any individual status update by clicking on the little ‘padlock’ next to the share button before publishing an update. You can leave it a bit open. For example, putting up pictures of you and your buddies in Vegas may be fine for everyone but family and business. Great, so block those people from viewing them. A caveat: nothing is 100% in this world and Facebook is no exception so be smart about what you put up there. I like to govern myself like everyone in the world is watching because, in some ways, they are. This is something that I have become very fond of this year. Facebook kind of copied this from Twitter but you know what they say: Good artists create, great artists steal. We all spend enough time up on Facebook. Having to go to other people’s pages to do things like wish them a happy birthday or paste the same link on their wall that you just put on your own is just not an efficient way to work. Now you can do both at the same time without falling into the trap of inadvertently spending too much time on other people’s pages. Some may consider this anti-social so if you have the time to hang out on all of your friends’ wall, be my guest. You can do this by typing the ‘@’ symbol at any time in your status/link/video/etc. update and start typing a friend’s name. The list that appears will quickly start to refine itself until you get the person you want. It may take a second or two to show up. Be patient. So go ahead and try out some of these tricks. I’m willing to bet that they make it significantly easier to sift through all of the overwhelming content you must already be exposed to and/or save some time in your dealings with Facebook. And after all folks, isn’t that something that’s been on your mind? 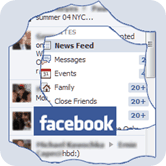 Do you have any tricks you like to use to make your Facebook life easier? Post them up here. They might make it into my follow-up post.